Here’s the link to the project home page and here’s the link to the recently-released Alternatives Analysis for the project. Five alternatives are under study: the usual no-build option, traffic signal and intersection improvements, bus rapid transit (East L.A. to Pasadena), light rail (East L.A. to Pasadena) and a tunnel to link the 710 from its terminus at Valley Boulevard to the 210/134 junction in Pasadena. ExpressLanes open on 10 freeway! On which exact streets (by street name, address and city) will you be conducting these tests? I don’t have the list. I’ll check on Monday. I think Metro is dying to have at least one big dig. Most likely the 710 would be the chosen one. The other Big Dig project could be the Sepulveda pass. Light rail is a ridiculous non-alternative the Highway Overlords at Metro put into the study just to appease those who see the waste of building a $10+ billion tunnel as a subsidy to the trucking industry (thereby creating even more congestion on ALL Southland freeways) – this study is a complete joke. Geotechnical testing?? It’s already been decided people: this project WILL BE A HIGHWAY TUNNEL and nothing else or less. Sorry about that – my bad. The info is available by calling 855-477-7100 — they’ll ask for your address. 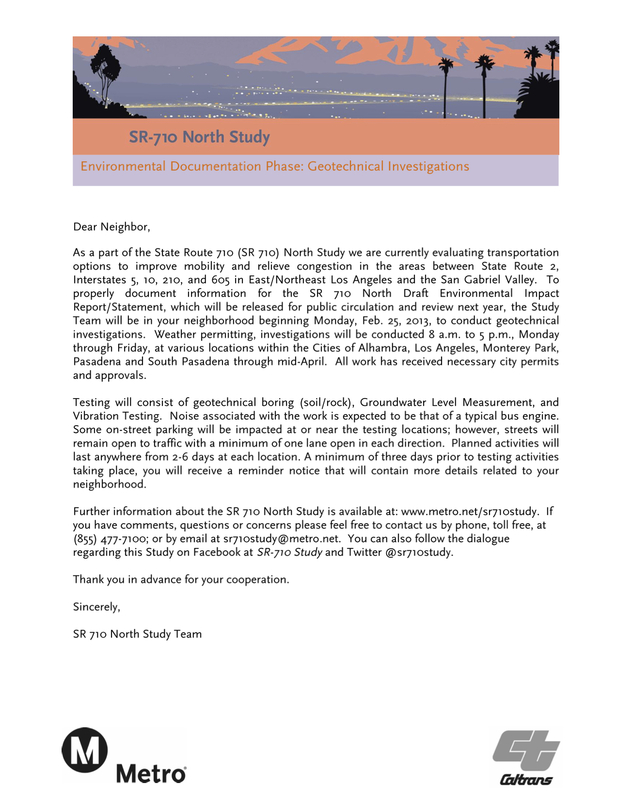 Also, residents who live in areas to be tested are or have already been notified by mail.